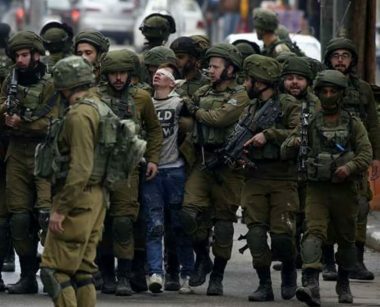 Affidavits, from a number of Palestinian children, for the Prisoners’ Affairs Commission reveal that they were subjected to systematic beating and torture, during and after detention by Israeli forces, the commission said on Tuesday. Commission attorney Hiba Ighbarieh documented testimonies from three children held at Majido prison, regarding what they went through during and after being abducted by Israeli authorities. WAFA reports that Munir Dari, aged 16, from al-Eesawiyya neighborhood, in occupied East Jerusalem, told the attorney that he was assaulted by several members of the Israeli security forces, upon his detention in his neighborhood, who beat him at random all over his body. He was also subjected to beating and cursing at the Russian Compound detention center, in West Jerusalem, to pressure him into confessing to the charges against him. Fahd Qeisieh, 17, also from al-Eesawiyya neighborhood, was beaten after being caught during confrontations with Israeli forces in his neighborhood. He said that a policeman tackled him and dragged him to a police car, where another officer stepped, with all of his weight, onto his back while two others were violently beating him, as he was forced to stay on the ground. Beating continued at the Russian Compound interrogation center, where he was hit with a stick on his hands, legs, face and back, while being forced to kneel in confession. Firas Masri, also aged 17, was also severely beaten and attacked by several soldiers when he was detained at an army checkpoint near the northern West Bank city of Qalqilia. He said that he was thrown on ground covered with gravel, beaten on his head and back, resulting in injuries and bruises. He was also reportedly cursed with vile words, after which he was blindfolded and handcuffed, and then dragged on the ground for a long distance before being thrown into an army jeep and taken to a police station in the illegal settlement of Ariel. Another commission attorney, Hussein al-Sheikh, reported that two other children, Mohammad Hadieh, 16, from Bethlehem, and Fawzi Masalmeh, 18, from Azzeh refugee camp, also in Bethlehem, gave affidavits of severe beating during arrest.